There are experiences in life that you can never really prepare yourself for. When they happen, they become ‘Real’ and you find yourself touching the divine in some way…real joy or pain brings about a kind of wonder and awe that separates us from everyday life. As I get older, I find myself looking for those Real experiences, as they are the only things that help us move forward. When my son was born, I experienced such a moment. I obviously knew I was having a baby, that he would be a boy, and that his name was Brian Thomas. We had clothes and gear and a room all set up, but somehow when they showed him to me that December evening, I found myself astonished that I actually had a baby, that he had lived inside me, that now he was ‘here’. It got real, fast. When my mother died, it wasn’t unexpected. She had been sick for a while with cancer, and even before that, had struggled so much with COPD and emphysema, that anyone could have guessed her life would be on the shorter side. Any time I left her presence as an adult, I wondered if that would be the last time I would see her. Every holiday as we drove away from their house, I wondered aloud if that was the last Christmas, the last Thanksgiving. It seemed like I was well prepared, as I had rehearsed what that loss would feel like for years. I thought I had a head start on grief, but I was wrong. Again, that very Real experience did and continues to bring me to my knees. I have had other Real moments in my life, too. I’ve experienced God in real ways, connected with my dear ones, had times of clarity and supernatural peace. Many of them caused me pain and then growth, and I can see so much of that in the rear view mirror. As I get older, I want more ‘Real’, though I know it might cost me. I fear the time when my children leave home, so much so that I can’t rehearse it ahead of time. After all, ‘Real’ is about the present moment, as that is all we have, all we are given. That is a truth that is clearer to me, all the time. 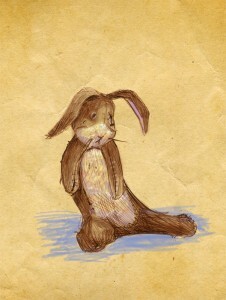 The last gift I ever gave my mother was a storybook about the Velveteen Rabbit. It’s about this process of becoming ‘Real’, about the journey she had almost completed, and the road that I am currently traveling. I read it aloud to her two days before she died, and she smiled and nodded as I read. She knew where she was headed. I want the same deep, true, Real knowledge. Amen.